March 13, 2013, Santa Rosa, CA — Sonoma County Winegrowers and Sonoma County Vintners recently received the results of research commissioned last fall to study consumption and perception of Sonoma County wines among high frequency wine consumers, representing a demographic responsible for over 50% of $10-20 sales and over 90% of $20+ sales nationally. The content and format of the research was designed to serve as a baseline to measure effects of the joint brand and marketing campaigns that launched at the end of 2012 and conjunctive labeling which is to be fully implemented by January 2014. The research will be repeated within two years to determine the impact of these programs on consumer perception and preference. Conducted by established wine industry market research firm WineOpinions, the survey group included over 900 respondents, 43% female and 57% male, all of whom are core wine drinkers, meaning that a vast majority (87%) drink wines at least a few times a week, and almost half of them (45%) purchase wines costing $20+/bottle once a month or more often. The main objectives of the 2012 research were to measure awareness and trial rates of Sonoma County wines, its AVAs, and that of competing wine regions, as well as measure perception of quality, value, and reliability of Sonoma County wines. 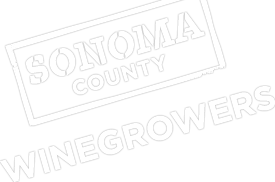 Additionally, the research dedicated a few questions to consumer interpretation of conjunctive labeling when Sonoma was present in the AVA name as well as county. This was to provide further clarification to the research conducted in 2009. Over half (56%) of respondents consume Sonoma County wine on a monthly+ basis, following closely behind only Napa Valley wines (60%) and higher than any other top national or international wine region. Sonoma County is the only wine region ranking in the top three for both quality and value-focused questions. Their peer groups were completely different in each category, with Sonoma County being the only one appearing in both lists. When measuring understanding of wine labels, listing only the AVA (without Sonoma County) is associated with a higher degree of confusion about whether the AVA is in Sonoma County or not, with 36% – 42% assuming it is, but roughly one-third unsure. The rate of correctly associating an AVA’s location as being in Sonoma County rises with the addition of Sonoma County on the label. In further label-related findings, between 10% and 20% of respondents believe that the geographic designation refers to where the wine was made, rather than where the grapes were grown. This (incorrect) assumption is diminished when both Sonoma County and the AVA are listed. Wines labeled with Sonoma County are clearly perceived as being of higher quality and higher priced than the same wine labeled as from California. Editors: A summary of findings and key slides is attached below. Sonoma County Winegrape Commission, dba Sonoma County Winegrowers (SCW), was established in 2006 as a non-profit marketing and educational organization dedicated to the promotion and preservation of Sonoma County as one of the world’s premier grape growing regions. With more than 1,800 growers, SCW’s goal is to increase awareness and recognition of the quality and diversity of Sonoma County’s grapes and wines through dynamic marketing and educational programs targeted to wine consumers around the world. For more information about SCWC and its programs, visit www.sonomawinegrape.org. Wine Opinions is a provider of consumer research to wine producers, importers, marketers, and industry associations. As the only Internet-based research group with a sole focus on the wine industry, Wine Opinions offers research insights and analysis on issues including trends in taste and usage; brand preferences and perceptions; package and concept testing; and regional awareness and qualitative evaluations. With its proprietary panel of high-frequency, high-end wine consumers and members of the U.S. wine trade, Wine Opinions is able to serve wine companies of all sizes with studies that are specific to their needs, timely, and cost-effective. Learn more at www.wineopinions.com.